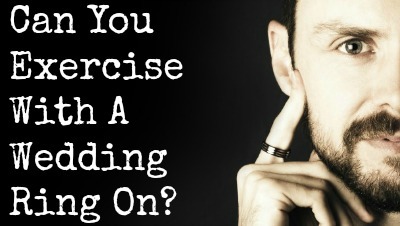 Can You Exercise With A Wedding Ring On? Home/Information/Can You Exercise With A Wedding Ring On? One issue for Men’s wedding rings in particular is whether or not it’s wise to wear your wedding ring while working out. There are a few different issues to cover here, only some of which may be applicable to your particular exercise regimen. One option of course is just to take the ring of before exercising. This is a reasonable option, but it’s very easy to forget to do so, and can also increase the likelihood of losing the ring, which is the worst possible outcome. Here are some other challenges, with some options of how to get around them. The obvious problem when it comes to lifting weights, is the extreme pressure that is placed upon the wedding band. This is particularly problematic for softer metals like gold and silver, as they can not only scratch, but bend out of shape. If you choose one of the softer metals, it may be best to get in the habit of putting the ring somewhere safe prior to lifting weights, and making sure you put it back on immediately after the session. A stainless steel or titanium wedding ring won’t bend or dent, but is still likely to scratch if using heavier weights, but are more durable than gold. A ceramic or tungsten wedding ring won’t bend or scratch during even heavy weightlifting, so these are the best options for someone who wants to be able to leave their ring on. Please keep in mind though, this is only true for plain ceramic or tungsten wedding bands. As soon as you add gold, platinum or silver as an inlay or plating, any soft metal that is in contact with the weight’s bar may be damaged. Any exercise that induces sweating (whether it’s weights, running, cycling or swimming) can cause discoloration to the skin, and tarnishing of the metal for certain wedding rings. This is normally with rings that contain copper content. Silver wedding rings are the most susceptible, as even contact with oxygen will cause them to tarnish. Gold rings that contain copper as a strengthener (particularly rose gold for example) can also cause the skin to discolor, and sweat, chlorine, and salt water can be the culprits in causing this to occur. None of the modern materials (steel, titanium, tungsten, ceramic) will tarnish or discolor the skin while exercising. So if you do do a lot of exercising, you may want to think about going with one of the modern materials for your wedding ring, or alternatively, put your precious metal ring in a safe place while working out. It’s also very important that if you do purchase a modern metal wedding ring, and it is plated or inlaid with a softer metal, that you be more cautious than if you have a solid modern metal ring. If you have any more questions about exercising with a wedding ring, please don’t hesitate to contact us.